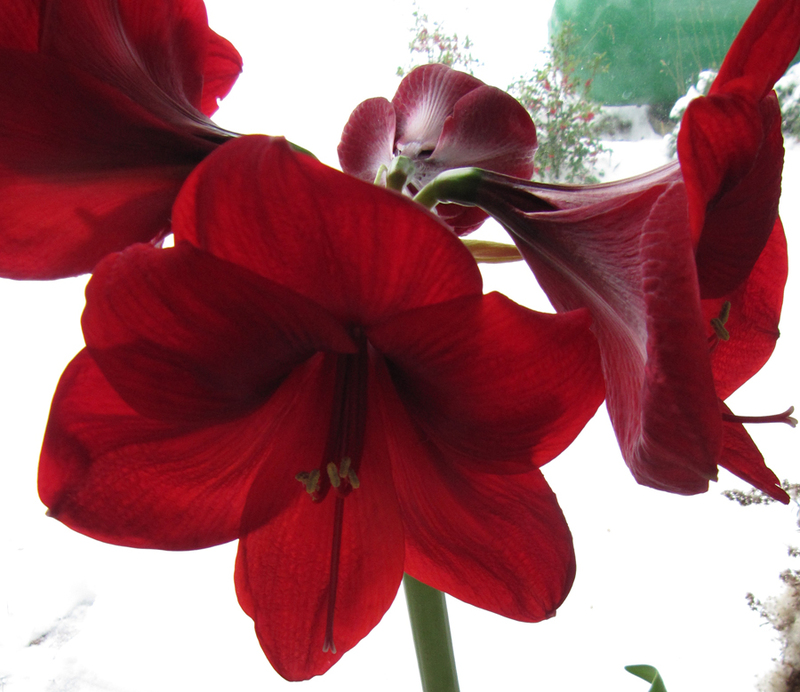 Evergreen - The amaryllis I kept for myself. 12, beautiful cream and light green, star-like flowers on two stalks. The blooms didn't last long and the flower stalks are ridiculously tall. 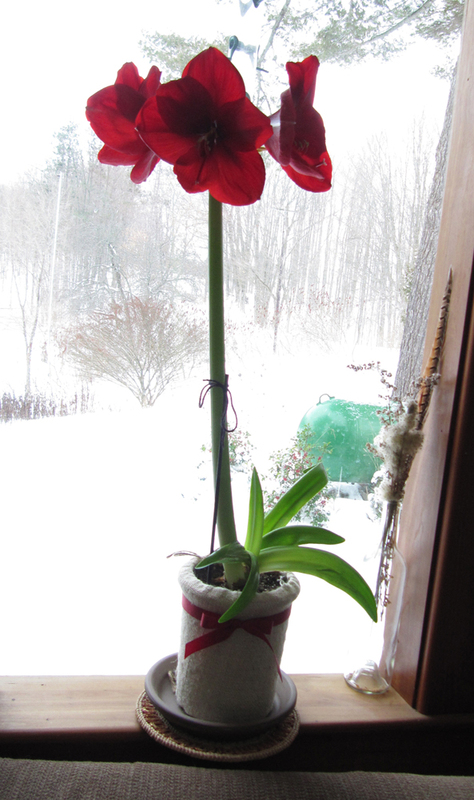 design job I had in October, I decided that my family would each get a Christmas amaryllis. Having never tried to grow them before I was a little nervous, but they were a cinch. I had six bulbs–Flamenco Queen, Picotee, Black Pearl, Evergreen, Prelude and Gervase–and have had tremendous success with them all. You could, literally, see them grow an inch or more a day. The photo of Flamenco Queen in Room to Grow was taken on November 30. By December 2oth she was blooming. The bulbs were planted in recycled plastic pots so, with a little design help from Lisa, I made little jackets out of burlap to cover each pot. 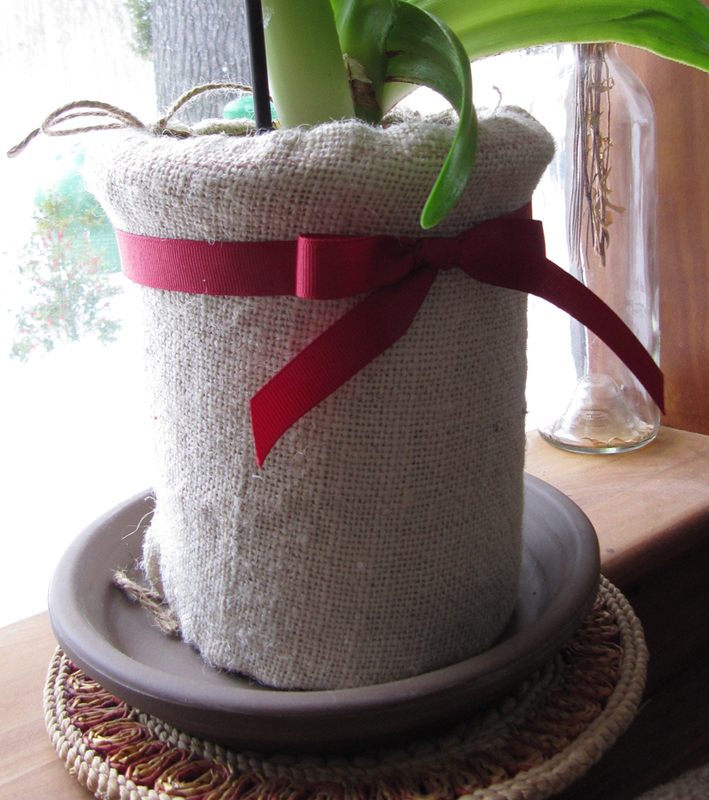 The burlap is sewn into a tube about 3-4 inches taller than the pot. A hem with enough room to draw a piece of twin through was then sewn on each end. The twine was snugged up so that the sleeve fit the pot. It was Lisa’s idea to leave the bottom open and to use the same hem/twine design for the bottom that I’d used on the top. I added a ribbon to match the flower to complete the design as well as instructions on caring for the plants. The instructions included two methods: a: full-on amaryllis care; b: return it to me when it stops blooming and I’ll return it in bloom next Christmas. 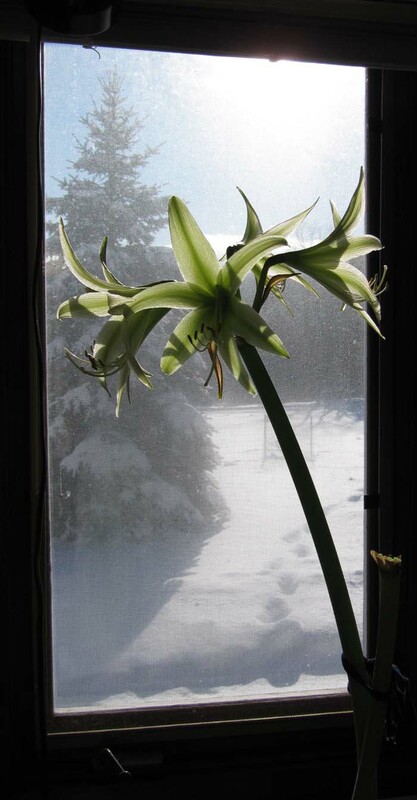 This entry was posted in Green Living and tagged amaryllis, amaryllis care, Bulbs, Burlap, Christmas, Flowers, galaxy black pearl, gervase, Holidays, Nature, picotee, Plants, plastic pots. Bookmark the permalink. Wow! They sure did end up being beautiful! What lovely gifts!